The Sekumpul waterfalls are much more famous than this cousin, but that only means there will be fewer people when you visit. These falls are almost as big. Also, this isn’t just one waterfall. Three separate waterfalls feed the waters of the gorge here. The water is cool, refreshing. Be careful when visiting in the rainy season, as the volume of water swells significantly, especially on the river you have to cross to get to here. Make sure to bring your own water and snacks. Good shoes and sturdy sandals are recommended. Don’t go there alone, as there are no signs to guide you. Ask for a guide in the village. 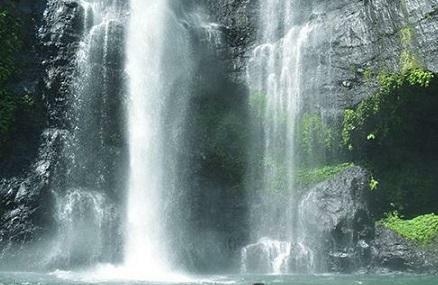 For the same admission price you can visit both Sekumpul and Lemukih waterfalls. Times given here include hiking time to the waterfall and hiking time back. Drive to Sekumpul Village. Park and head through the village till you reach a spectacular lookout. Head right to the Lemukih waterfall. It’s a steep but short hike downhill. It’s best to keep asking directions as you go. You will have to cross the river at several points. How popular is Lemukih Waterfalls? People normally club together Gitgit Waterfall and Tegalalang Rice Terrace while planning their visit to Lemukih Waterfalls. Lemukih waterfalls are part of Sekumpul waterfalls, the three waterfalls on the left side. the most beautiful. lots of steep steps. Absolutely incredible breathtaking waterfalls! Well worth the walk and afterwards the swimming is a great cool off! The guides are so helpful if you need a hand getting through some difficult sections of the path or help taking photos. The restaurant at the end of the tour has some really great local foods and drinks. If you decide to go on the trip to these waterfalls I definitely recommend to get a local guide so that you can give the small fee back to in support of the local community who has created such a vibrant beautiful environment, at the same time as them sharing much of the information only true village locals will know. One of the best Waterfall that setting in peaceful village Lemikih. Cool area behind of hill, full of Clove or Coffee plantation and some kind of tropical fruits. Come.. and check it out. Love it!! Worth hurting local guide. They help you song the way, you pay them so they pay the fees to see the other falls, and it helps out the locals. Definitely peaceful and picture perfect! !